THE sport of rugby league runs deep in family lines. 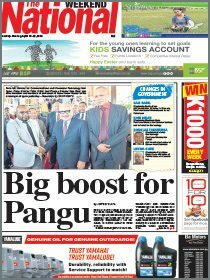 And for former PNG Kumul household names Joe Gispe of Jiwaka and Jimmy Peter of East New Britain, this is no exception. The legacy of these two families will live on when sons, Brian Gispe and Jimmy Peter, carry on the ideology of their fathers and idols onto the paddock. Former Kumul lock (Joe) Gispe played his best rugby league in East New Britain before being selected in the PNG Kumuls. He was one of the first out-of-town players, who flew in every weekend to Port Moresby to play for the then-Air Niugini club in the Port Moresby Rugby League competition at Boroko. 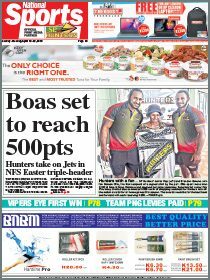 Gispe and the late Tuiyo Evei were the two most sought-after players who helped Air Niugini win a premiership and become one of the most dominant teams in the Port Moresby rugby league competition. Gispe and Peter were strong, uncompromising players who played for the New Guinea Islands in the zone champions in the late 1980s and the 1990s. They also donned the famous red-gold-and- black of the Kumuls. Freelance photographer Reuben Pokanau of Cs1 Media recently caught up with the two sons of the former greats at the Kalabond field in Kokopo. The youngsters are members of the Agmark Rabaul Gurias team in the Digicel Cup. Pokanau recalls playing with the two seniors 30 years ago during the 1987 grand final between Kaivuna Sea Eagles and NGIP Kokopo Muruks as a flying Sea Eagles winger.